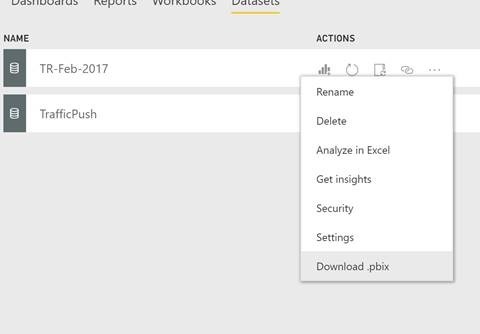 In the April update of Power BI Desktop, we released the ability to connect to datasets in the Power BI service. This feature allows you to create new reports off existing datasets you’ve already published to the cloud. You can leverage this feature to better collaborate and reduce duplicate efforts across your team. Model once, create many reports from that model. Many Power BI users tell us that data cleaning and data prep tasks take up 70% of their time when creating a new report. Now, you can do the data modeling once and then create new reports on top of that same model, while still remaining in Power BI Desktop. Every time you publish a new dataset to the service, you need to make sure data refresh is scheduled and the credentials are set up. If there are issues with refresh such as a password change, you’ll need to go and update that on all your datasets using that source. In addition, the more datasets you have with scheduled refresh on that source, the more load that source will incur when refreshes take place. If your reports are all leveraging the same dataset, this only needs to be managed once. Divide up work between your team. Instead of everyone in your team needing to do data modeling and report authoring, you can divide up the tasks. One person can be responsible for doing the data prep and managing the dataset. Others on the team can focus on report authoring and visualizations. Leverage content packs as a starting point for your reports. Not only can you connect to datasets you or your teammates have created, you can also connect to datasets created through content packs. 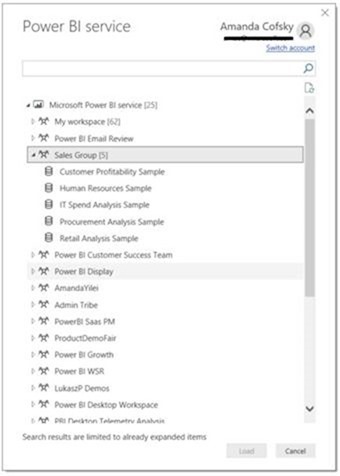 For example, you can connect to a service content pack that you’ve set up such as Dynamics or Quickbooks and leverage that dataset in Power BI Desktop. In addition, you can make a copy of any Organization Apps you have installed to create new reports from those datasets in Desktop. 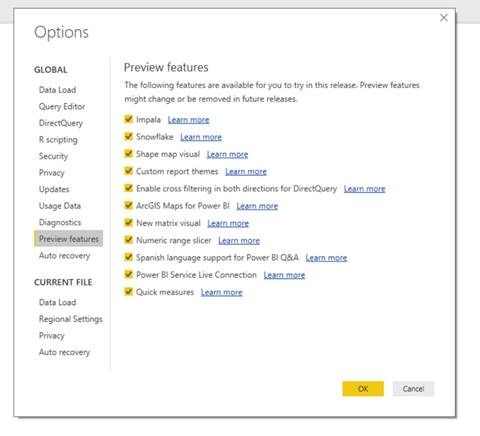 To get started with this feature, you’ll first need to enable the preview option in Power BI Desktop. Navigate to File > Options and settings > Options > Preview features and enable Power BI Service Live Connection. You’ll need to restart Desktop in order for the option to take effect. 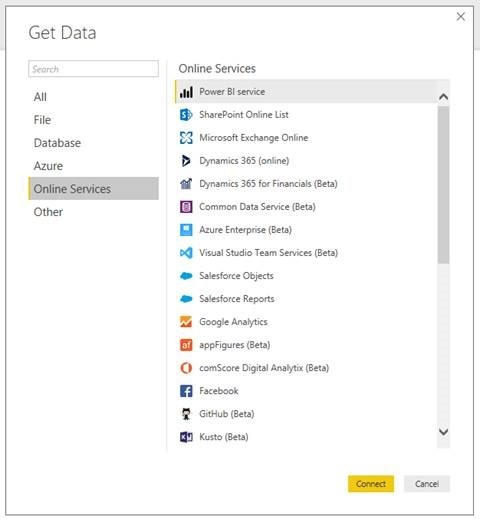 When you create a new Power BI report, you’ll see the Power BI service option under Online Services. Datasets you have edit access to. These include datasets you’ve created or datasets you have edit access to in a shared workspace. Datasets created from service content packs should show up in this list as well. Datasets coming from data sources via import, DirectQuery or Push. We do not yet support SSAS data sources via this method, but it is on our roadmap to support this as well. Datasets from Organization Apps once you’ve made a copy. In order to get edit access to a dataset in an org app, you first need to make a copy. Once you’ve connected to a dataset, you’ll get a read-only view of the model. The data view, relationship view and all modeling actions will be disabled. Once you’ve created the report, you can publish it up to the Power BI service to pin to a dashboard and share with others. For more details about how to use the feature, step by step instructions and any current limitations, check out the documentation. When you download a report that is live connected to a dataset on the service, it will remain live connected when you open it in Desktop. This means you have read-only access to the model. What if you need to make changes to the original dataset? 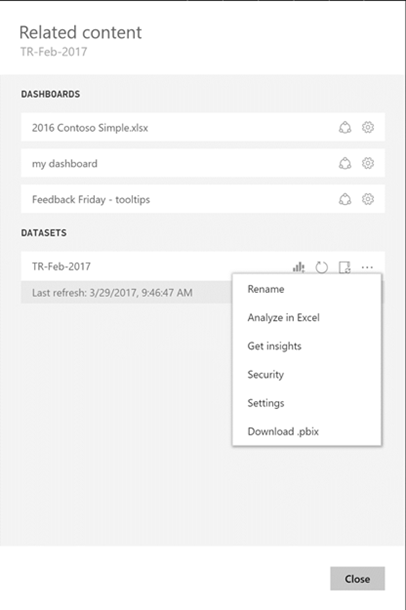 In your list of datasets for any workspace, you’ll see the Download .pbix option in the context menu under the “…”. What if you don’t remember which dataset you were using for this report? Using the new Related Content Pane in the Power BI service, you can find the dataset and quickly download the PBIX that contains the model. Please give the public preview a try and share your feedback. As always, if you have ideas for new capabilities you’d like to see, post them on our User Voice forum.